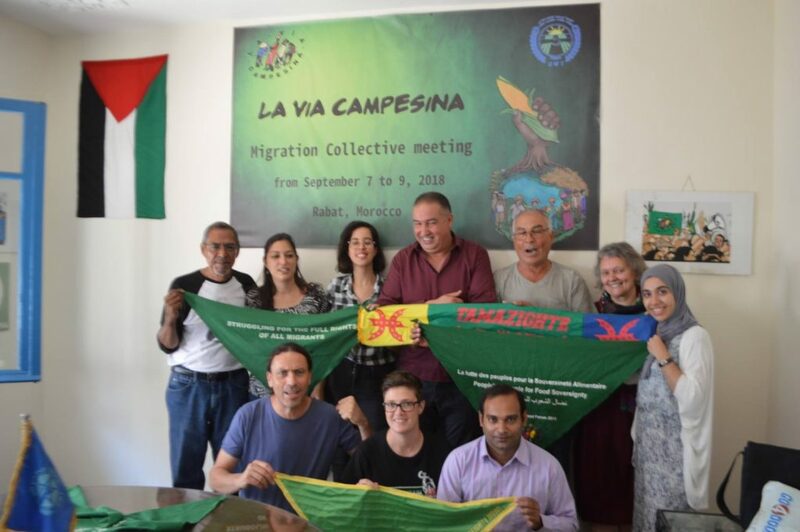 Having met in Rabat, under the auspices of the Fédération Nationale du Secteur Agricole, on 7, 8 and 9 of September 2018, the International Collective of Migrations and Waged Workers of La Via Campesina, launches this call of action to all organizations, regions and collectives to mobilize for the full rights of migrants and refugees in the framework of the imminent approval of the Global Compact for Migration taking place on the 10th/11th December in Marrakech. This event occurs at a time when the migration crisis has worsened due to the fact that the powers of the North have decided to close ranks to contain migration and block the movement of refugees, using countries of the South, such as Morocco and Mexico, for example, to contain it. This has resulted in an increase in the violation of the human rights of migrants and refugees, in more migrants imprisoned in concentration camps, including children and entire families and in more deaths at sea and in the deserts that are the routes that followed by international migration. On that occasion, the states will meet to finalize a Global Compact for Migration that does not represent a change in anti-immigrant policies and in the current offensive against migrants and refugees, mainly from the North. It is more of the same; migrants and refugees as cheap labor for the economies of the North, criminalized by the mere fact of being migrants and refugees and no political will to address the underlying problems of current migration. For its part, La Via Campesina will be in Marrakesh to present a political alternative that goes to the very roots of migration and the exodus of refugees and to demand for their full rights within the spirit of solidarity that an attack on one is an attack on all. 1. To hold an alternative summit for a Global Compact of Solidarity with Migrants and Refugees that guarantees the full rights of immigrants and refugees and preserves their human dignity. 2. To denounce the regressive content of the pact in relation to the gains in human rights, its political and security-related essence, and its aim to subject immigrants and refugees to the market logic. 3. To participate in all militant actions in order to pressure governments to withdraw this degrading and outrageous pact. 4. To stress the energetic and dynamic participation of LVC regional organizations in Africa in order to denounce the deplorable and atrocious situation of Sub-Saharian immigrants and refugees in Morocco. 5. And to stop the building of walls, detention centers and the militarization of the borders. Unity of Action for the Full Rights of all Migrants and Refugees!